I often have friends tell me that they want to visit an all inclusive resort which is both toddler friendly with great amenities for the grown-ups. Since I have visited recommended Azul Beach Hotel numerous times, I thought I should write a post about my experience for everyone. Azul Beach Hotel is a resort which caters to families with toddlers. From their partnership with Fisher-Price, to high-chairs in every restaurant, this resort is a destination for families with little ones who want a relaxing vacation. My husband and I traveled to Mexico in September with our 18 month old daughter. and I’m so happy we did! After a 4 hour direct flight to from Toronto to Cancun airport it was a short 25 minute ride to the resort. We chose to use the shuttle which was included in our package, but it did involve waiting for all of the other passengers to get picked up. Fortunately, there was a bar in the parking lot of the airport where the husband and I could grab a beer while we wait. Best way to start a vacation! Check in at the hotel was wonderful! No standing in line at a check in desk, when you come here. Instead, you are seated on a lovely sofa set, the adults are given glasses of champagne and children are greeted with a fruit smoothie. The wet towels to freshen up were also a great touch. During our check in we were able to choose items for our daughter to use during our stay. We were fortunate to have been upgraded to a Wedding Swim Up Suite which provided plenty of space! With respect to food, I found that the morning buffet provided plenty of selection eggs, toast, bananas, cereal and pancakes for our toddler. There was also an a la carte menu which is fantastic for the grown-ups. For lunch we generally tended to take advantage of the lunch picnics which are delivered to the beach beds. This was perfect for us, as our little girl would nap on our beach bed, overlooking the ocean while we ate lunch, read and listened to music. There is no dinner buffet like some other resorts. All restaurants are a la carte and did not require reservations. The best part was that the staff worked hard to ensure the little ones were happy and entertained while the parents ate. They would come by with toys, videos and in general were always so caring. If you are looking for a party-scene at night, then this is not the resort for you. The evenings are VERY quiet, with families taking to their rooms early so that the little ones can sleep. Having a swim-up suite was beneficial b/c it allowed us to lounge on our deck or the lazy river while keeping an eye on our little one while she slept. While we were there, there was a new section of the resort being built which should be done by now. I’m excited to go back and check it out. If you have any questions, please leave me a comment! P.S. Please note neither this trip nor blog post were sponsored. Just my opinions! 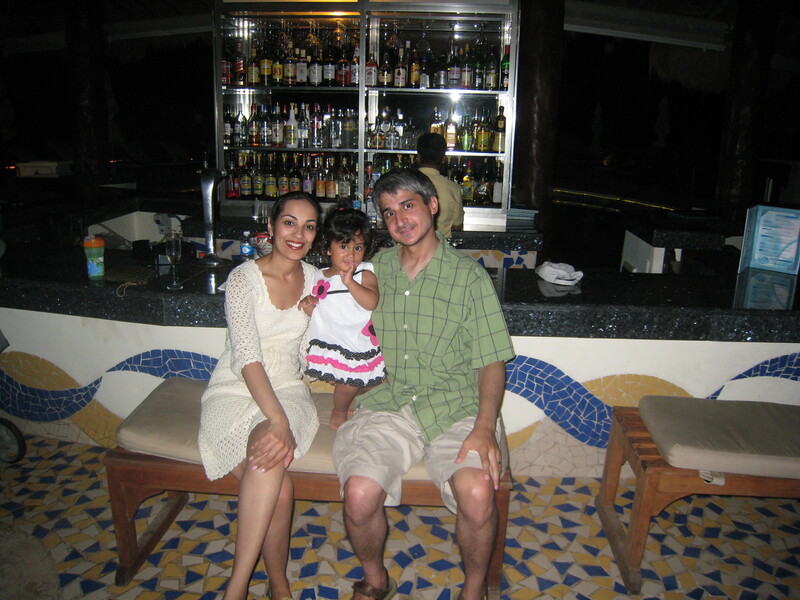 This entry was posted in Travel and tagged Azul Beach Hotel, Mexic, Resort, Vacation by shwetasays. Bookmark the permalink.